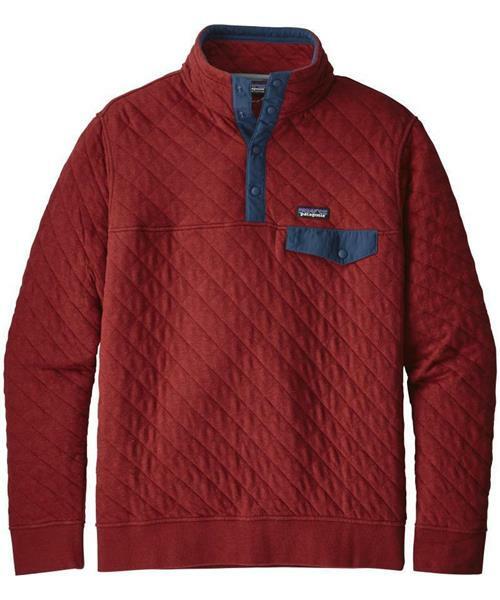 This heritage-inspired version of Patagonia's classic Synchilla® Snap-T® Pullover is built for everyday layering and warmth. It’s constructed from soft 79% organic cotton/21% polyester jacquard knit fabric with lofty fill yarns of textured polyester for breathable, cozy warmth; 1" diamond quilting creates an effective heat-trapping surface and reduces bulk while increasing compressibility. Details include: left-chest pocket with nylon Snap-T-style flap and snap closure. Doubled, Stand Up collar with 4-button snap placket, wide 2¾" rib-knit cuffs, climbing cord hanging loop and inside contrast collar tape brushed for softness. Hip-length hem.